San Francisco was once called the Baghdad by the Bay by the late newspaper columnist Herb Caen, a moniker derived from the city's ability to captivate, attract and enchant generations from all walks of life. But decades later, many people plan to leave. Less than 48 hours before polls open for the California election, the business-sponsored Bay Area Council advocacy group released its annual survey of registered voters in the nine-county Bay Area showing that 46 percent are likely to move away, the highest percentage in three years. Bay Area employers are losing talent and many companies are relocating to more affordable housing venues in the state, or much more likely, leaving California altogether, the Council says, as rising housing costs far exceed the compensation to cover monthly payments. Housing costs topped the list of issues for the fourth straight year. Not surprisingly, 42 percent of those polled in an open-ended question said the housing crisis was the most troubling issue. Just two weeks ago, the California Association of Realtors said a San Francisco household would need to make $333,000 a year to afford a median-priced home of $1.6 million using a 20 percent down payment and a 30-year mortgage with a rate of 4.44 percent. Only 15 percent of current S.F. households reach that compensation level, the Realtors said. For renters, it's not much better; the average rent for a one-bedroom unfurnished apartment in the city is about $3,258 per month. Most troubling for the future of the regional economy, is that millennials plan to flee; 52 percent said they will depart vs. 46 percent last year, the Council poll says. 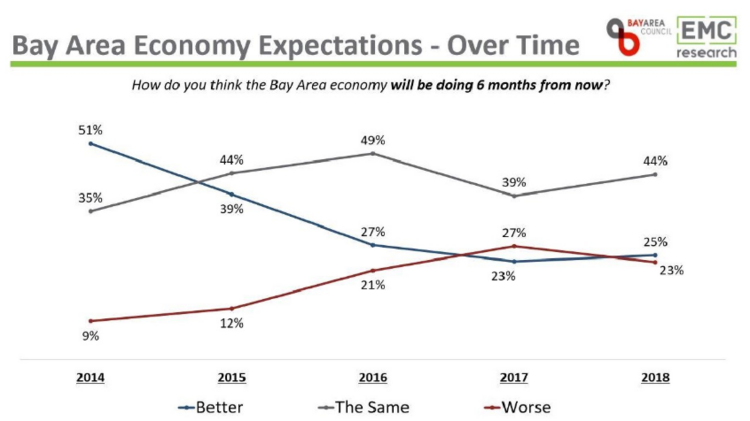 Despite full employment, only 25 percent of those surveyed say the regional economy is going in the right direction; in 2014, 57 percent said the economy was favorable. This year, 47 percent said they expected "a significant economic downturn" within three years, the Council said. 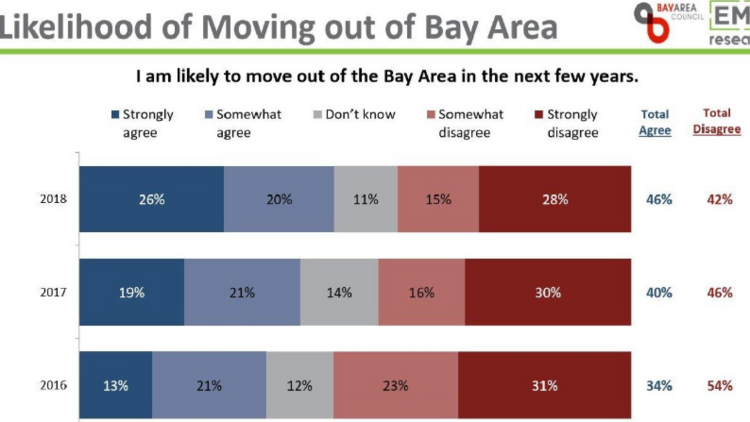 Of the people surveyed in the online poll who said they want to leave, only a quarter plan to stay in California. Sixty-one percent said they would relocate outside California and 10 percent are eyeing Texas. Oregon, Nevada and Arizona were mentioned, too. Six percent said they want to go anywhere that was affordable with lower taxes. Bay Area traffic congestion was the No. 2 most-mentioned problem and homelessness followed. In a possible sign of voter dissatisfaction in the coming election, 56 percent of the survey respondents said local governments are responsible for making housing more affordable and 66 percent said those same bodies should be reducing traffic congestion and providing more and better transportation solutions. About 19 percent of voters believe the tech industry should fix housing and traffic problems in the region. The 2018 Bay Area Council Poll was conducted online by Oakland-based EMC Research from March 20-April 3. EMC surveyed 1,000 registered voters from the nine counties in the Bay Area. Last Thursday at Facebook Inc.'s annual shareholders meeting in Menlo Park, Chief Policy Officer Elliot Schrage said the social media giant must address the Bay Area's housing crisis "if we're going to remain a company in Silicon Valley for the long term." 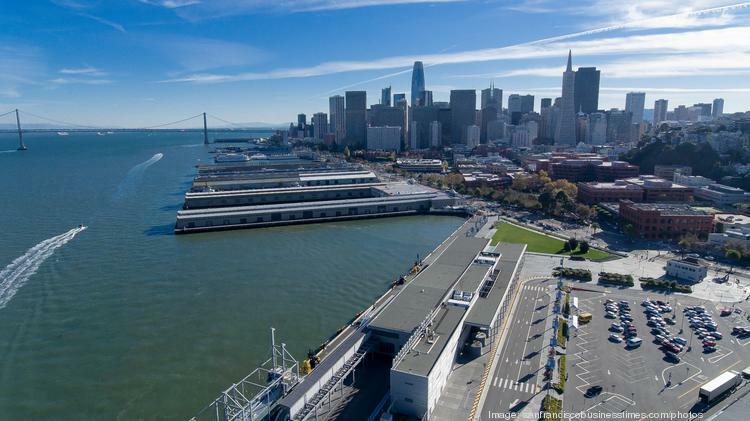 "Our position is that Silicon Valley has been this extraordinary engine of economic opportunity and if we can't solve the housing and transportation issues, Silicon Valley won't be Silicon Valley," Schrage said. "These companies like ours will expand elsewhere. So we feel a real sense of urgency around that." The company predicted earlier this year that it could more than double its current headcount in Menlo Park to 35,000 employees over the next five years, eventually eclipsing the city's population. Facebook's proposed mixed-use Willow Village campus in Menlo Park call for 1,500 housing units, 125,000 square feet of retail, including an anchor grocery store and a hotel, along with 1.75 million square feet of office space. Facebook recently leased all of the 755,900-square-foot Park Tower, an under-construction office highrise in San Francisco. "We are late and frankly we have been slow — we are actually a relatively newcomer as a young company at only 15," he said. "But I think it is fair to say we have really made an investment and we consider this an existential issue." Conversations in the board rooms of Bay Area companies have “shifted dramatically” as the costs of hiring people locally continue to escalate, Yelp CEO Jeremy Stoppelman said at a panel discussion on housing held at the company's San Francisco headquarters in mid April. Many investors and board members are now asking about opening up locations outside of California because of the housing crisis, Stoppelman said. The obvious solution when a company continues to pay higher salaries is to ask whether an employee can be put in another city, like Scottsdale, Ariz., or Chicago or even New York City where they might be able to find housing “more readily and at a more reasonable price,” Stoppelman said in an interview with San Francisco Business Times tech reporter Alisha Green. Yelp has offices in all of those locations. “So absolutely we are load-balancing across our different offices,” he said. But he’s found the best tech talent continues to want to work in San Francisco. “You have to ask yourself why do we pay people a lot of money, and it’s because the cost of housing is so high,” Stoppelman said. Yelp has been paying employees more to help them deal with the housing crisis, Stoppelman said, but it also has the option of adding employees in its other offices around the globe. “It’s hard to see that impact in the Bay Area,” Stoppelman said. At the Charles Schwab & Co. annual shareholders meeting in San Francisco last month, Business Times banking reporter Mark Calvey asked the chairman if the new federal tax law capping the deduction for state and local taxes push some of the Bay Area’s most productive residents to leave California? “Probably,” Schwab told Calvey in brief remarks. “I would hope Sacramento would get more efficient and not raise taxes any more than they have. That would be good. That can be seen across Texas, where Schwab now employs 3,100, and in Austin, where it celebrated on May 31 the completion of three of four buildings in an office complex housing all 1,900 of its Austin-area employees. More than 100 additional jobs are posted in Austin. The online brokerage pioneer employs about 18,200 people in total, and 1,300 in in this headquarters city in San Francisco. City employment has dropped 18 percent from 2016 to 2017, according to Business Times research. "We have a lot of our (company's) growth outside of California — a lot more outside of California than inside California. “It’s a complicated subject,” said Schwab. It's also tougher for new home buyers in the Bay Area. The new tax law allows homeowners with existing mortgages to continue to deduct interest on a total of $1 million of debt for a first and second home. But for new buyers, the $1 million limit fell to $750,000 for a first and second home, difficult for San Franciscans where the median home price is $1.6 million. The state Public Utilities Commission, which regulates California’s largest power companies and ride-sharing companies, is moving positions from San Francisco to Sacramento because it can’t find new employees who can afford to live in the Bay Area. The PUC employs 800 people in San Francisco out of a total workforce of 1,300. “It’s hard to find a place to live in San Francisco on a state employee salary,” state PUC President Michael Picker told Sacramento Business Journal reporter Mark Anderson.